Using the tools in this panel you can control the earthquakes shown on the map. The minimum magnitude to plot is selected by the slider. The "Time" and "Depth" determines whether earthquake age or depth are used to color the symbol. *To reduce render time, queries have the following limits. Mount Baker is an ice-clad volcano in the North Cascades, located about 50 kilometers E of Bellingham, WA. After Mount Rainier, it is the most heavily glaciated of the Cascade volcanoes. Deposits which record the last 14,000 years at Mount Baker indicate that it has not had highly explosive eruptions like those of Mount St. Helens or Glacier Peak, nor has it erupted frequently. Historically, the most destructive and frequent events at Mount Baker have been debris flows and avalanches, some of which coincided with eruptive activity. The USGS provides a very Open File hazard assesment report by Gardner et. al., 1995. Heat flow and fumarolic activity became elevated in 1975, but were not accompanied by any other changes. The PNSN operates 2 seismometers on or near Mount Baker. Even though not well monitored compared to many other volcanoes, those stations near Mount Baker are quite sensitive and can detect and locate events down to magnitude 1. On average, we locate 1 to 2 earthquakes within 10 km of the volcano each year. We also often record seismic events related to glacier motion, and less frequently those related to rock-fall or ice/snow avalanches. See the seismicity page for a summary of past years of seismicity at Mount Baker. Below you will find an epicenter map, a time-depth plot and a count of earthquakes plot for the immediate Mount Baker area. The time-depth and count plots are for the time period since 2000 while the map includes all events located at Mount Baker since the first seismograph was installed in 1972. Compared to many of the other Cascade volcanoes Baker has a very low rate of seismicity. Note, that only some of the events are located right at the volcano. Also, for this catalog some shallow "low-frequency" events are included as well as typical earthquakes. We think that most, if not all, of these shallow, low-frequency events are related to glacier motion and are not real earthquakes. Because of the strong dispersion of seismic waves in the geologically complex rock of a volcano seismic sources at or very near the surface are hard to discriminate from real earthquakes at shallow depths. Most of the "green" events directly under the volcano on the map are these glacier related events. In addition to the shallow, low-frequency events there is a class of deeper low-frequency events called "Deep LP" for "deep long-period", which is a term used in volcano seismology literature meaning a type of earthquake thought to be directly related to the movement of volcanic fluids (i.e. magma). Such events have been recorded at Mount Baker (and a few other volcanoes). These events at Mount Baker take place deeper than 20 km and are not shown on these plots. 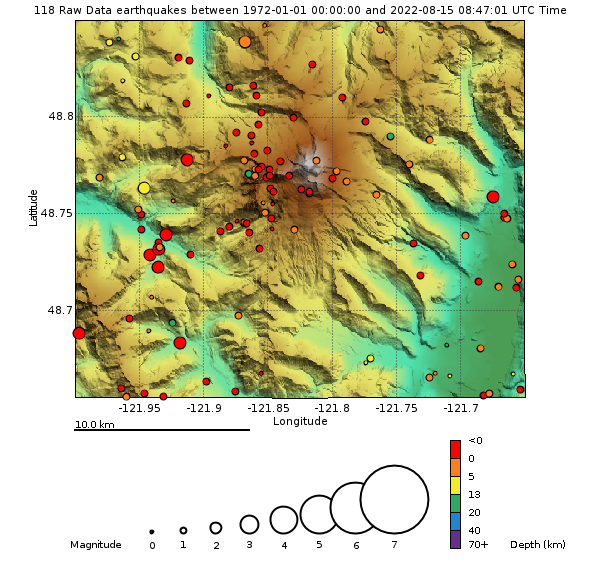 Outside this map there is extensive seismicity to the southwest of the volcano and to the northwest there is a very active area with several swarms of events in the Deming, WA area. While there has been only one seismograph located right at the volcano there are several very sensitive ones not too far away such that the regional seismic network can reliably detect and locate earthquakes of magnitdue 1.2 and greater in this area. Smaller earthquakes could occur without being detected. Below is a time-depth plot of events located directly under Mount Baker since 2000. This plot is updated weekly... unless, of course unusual activity takes place that suggests a different time sequence is needed to better interpret that activity. Many of the very shallow events (particularly the bunch in the summer of 2009 are of the "low-frequency" type that we feel are related to glacier motions, mostly from the Easton Glacier. NOTE: A depth of 0.0 (zero) km is at sea level and thus events within the volcano will plot above sealevel (negative depths). See the blog for more details. Here is a seismicity plot that shows the number of located earthquakes per week (black spikes) and the cumulative number of earthquakes over time (red). This can point out periods when more events were located in a swarm such as the two significant bursts of 'low-frequency" glacier related events in the summers of 2009 and 2010.